Have you seen the new Pinterest Communities feature in your Pinterest account yet? If you haven’t then please read on, to find out what Pinterest Communities are, how you can join them, and how you can form your own communities. Please be a sweetie and pin this image for me…..
I’ve been using Pinterest to grow my blog since the beginning of May, and I’m absolutely blown away by the results I have had and the number of users coming to my blog. As at the beginning of October I have 2 million monthly unique viewers on my Pinterest profile – that is up from just over 1,000 in April. Take a look at this post if you want to find out what I have been doing to grow my Pinterest profile and my blog, using Tailwind. 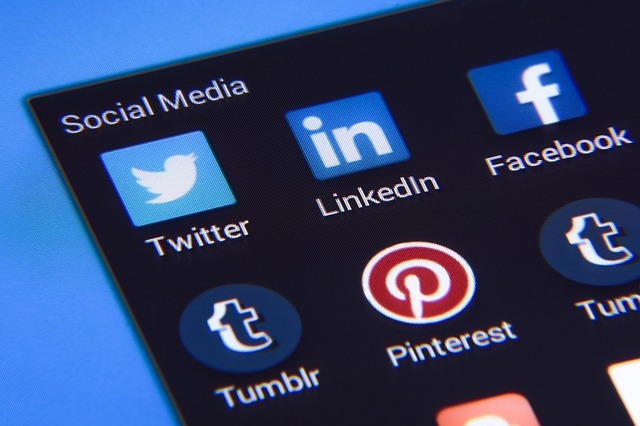 When I started working with Pinterest, I took a course online, and one thing I remember reading was that Pinterest is not a social media platform – instead, it is a search engine for visual items, more like Google or YouTube than Facebook or Twitter. Is Pinterest a Social Network? But now it seems that is about to change – Pinterest wants to be more than a search engine, and is launching a social function too. Introducing Pinterest Communities. How do I find Pinterest Communities? If you go to your Pinterest account, you may not be able to see the Pinterest Communities tab, and that is because you need to be invited to a Community in order to see them. This is quite clever of Pinterest – it will allow the Pinterest Community idea to roll out slowly, and only to those members who are actively using Pinterest. So before we go any further – if you want to see what Pinterest Communities is all about, please join one of my communities and let’s get you started. 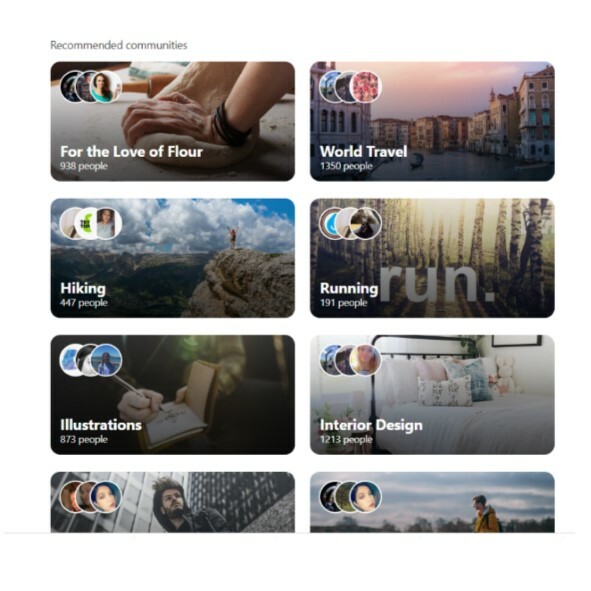 As soon as you join a community, then the Communities tab will appear on your Pinterest app, and when you click that you will be able to see the full range of Pinterest Communities available and join as many as you like. So how do Communities differ from group boards? Well, you can share pins to them and pin each other’s pins, but that is nothing new. What you do have, which is new, is a thread where you can chat, set up threads, post text, photos and blog links and reply to other people’s threads. So in this respect, it is very much like a Facebook Group. Some people have set up communities around their own businesses and I’m sure these will grow. I’m sure some people will use these communities to sell in, and maybe to share advice and tips in the same way that the best Facebook groups do. And I’m sure as it develops there will be some naff communities where people will set up a ‘community’ so they can just shout “buy my stuff” to their friends, but at the end of the day the internet is a free will zone, and it’s easy to leave a community if you don’t like what’s there. I think it’s very exciting to be in at the start of what promises to be an amazing new feature on Pinterest. I was a bit late to the party using Pinterest in general – I thought it wouldn’t fit the theme of my blog at all, but I was dead wrong on that. Now I can see real potential for this new Communities feature, and there is real scope to get my message out there. 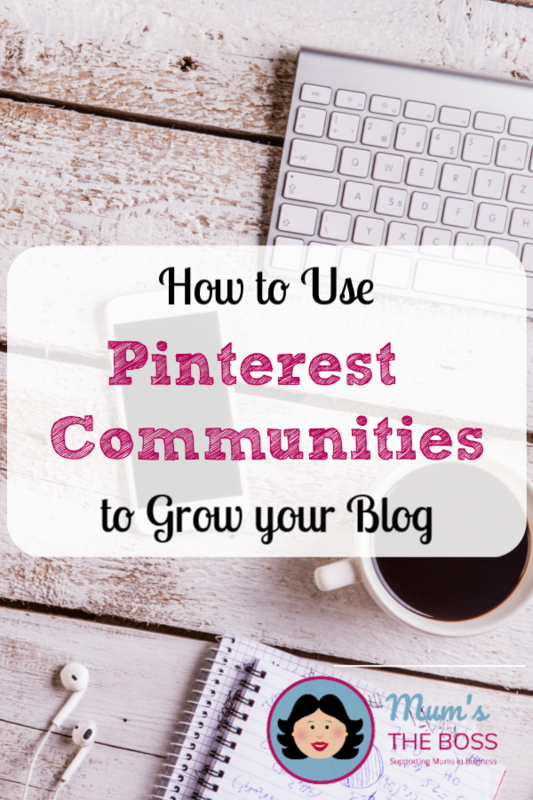 How can I use Pinterest Communities to grow my blog? So as a blogger, what’s the best way you can use this new Pinterest Communities feature to grow your blog and make connections? It’s very hard to know where this Community lark is all going to go, and it may be that a few months down the line we all have a bit better idea of what to do and there will start to be more specific do’s and don’ts for this new platform. But for the moment, it’s all brand spanking new, just a few weeks old, and so I would encourage you to just dive in, have a look around and start experimenting. Join the communities and see what is going on in them – follow the other members too and hopefully people will follow you back. It’s very exciting that this is so new that even the top Recommended Communities only have a few hundred members. I’m making a list below of Pinterest communities that I have found for bloggers in specific niches, so you might also find something to suit you there. Once you have had a look at communities, joined in and you feel happy with what they do, then maybe it is time to start your own community, either specifically for your blog or for your wider blog niche? There can be only one Pinterest Community for each name, so while the Communities feature is so new, it might be worth checking if your niche is still available and jumping on it while you can. I feel really blessed to have bagged the Healthy Eating community as I reckon that will be a biggie. If you do form a community yourself, then you can invite your Pinterest friends to it, one by one, or you can share the link and hope that others will find it. Here is the list I have so far of communities that I have either joined or found, that are suitable for mums and/or bloggers. Click on any of the links to join the relevant community. If you have formed a Pinterest Community and you would like me to add it to this list, please follow me on Pinterest – Mums the Boss Blog – then fill in the attached form here. I will follow you back, join your community and add it to this list. And if you have any comments about how you have been using Pinterest communities and what they have done for you, feel free to share. Wow! This is new and exciting! I joined one of your communities and one of your recommended ones. Can’t wait to see how this works. That is so exciting! I love this new feature. I hope I get invited to one. Ahh! So cool! The invitations are right in the article -just pick one of those links and you are in ! Wow I didn’t even know you could do this. Thank you so much for sharing this info. I really need to grow my account! It’s a brand new feature – not many people know about it yet. You are in at the start of something brand new! Fascinating post, I have Pinterest but really only pin my own posts. I need to develop this. Take a look at the post I link to in this showing my experience with Tailwind. It has been amazing for my site. I will be book marking this for later use! I love this thank you so much for these amazing tips & tricks! Just started using the Pinterest communities. Not quite sure yet how it works, but I am sure it will be awesome! I’ve been blogging for a long time and feel dumb saying that I don’t know about Pinterest Communities. Thanks for sharing about this. You don’t have to feel dumb – this is literally brand new since the middle of September – and because they didn’t officially announce it, you can only find out about it by reading a post like this. You are one of the first to know! I didn’t know about the communities. I’ll have to go join some of them. This is great information and can’t wait to see how it works. I am about to go join communities right now! It will be fun to see where all of this takes us. I’d love for you to join them. If you want to add them to your list, that would be great. So glad I found this post! Thank you for sharing I’m looking forward to putting what I’ve learned into practise!